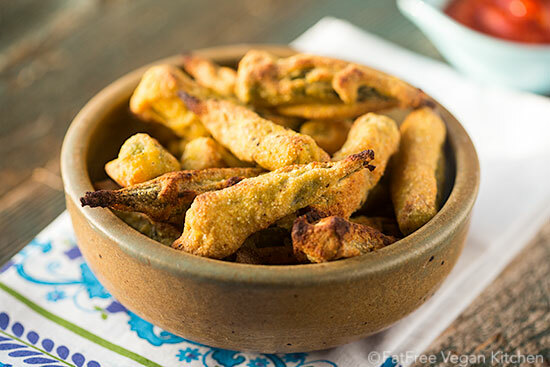 Crunchy, golden, and delicious, this oven fried okra is vegan and contains no oil or gluten. Prepare to be amazed! When I was growing up, I knew of only three ways to eat okra–in gumbo, stewed, or fried. As I’ve gotten older and had the opportunity to try recipes from around the world, I’ve grown to love okra in other dishes, such as curries, as well as my favorite (and the easiest) way to prepare it, roasted. I haven’t had fried okra in years because even if I could get past the oil involved in frying, I’ve never seen a vegan version on a menu. If you ask the chef, you’ll find she uses buttermilk, at the very least, and bacon drippings, at the worst. All of this is to say that I haven’t had fried okra in a very, very long time, so I’m not going to claim that I remember it well enough to duplicate the flavor and texture in a vegan, fat-free version. But I do think I succeed in doing what I set out to do, which was create okra with a crunch to it. As I said, I love roasted okra. Roasting it gives it a lovely smoky flavor and dries up all the “slime” inside the pod. But it doesn’t really make the okra crunchy, and recently I had a craving for crunch, so I set about figuring out how to accomplish that without using oil. I first experimented with using the traditional fried okra technique of dipping the okra first in buttermilk (vegan milk plus lemon juice) and then dredging it in a cornmeal mixture. Instead of frying it, I baked it. Unfortunately, cornmeal not spritzed with any oil retains its dryness through the baking process, so my okra came out pale and powdery, edible but not really crunchy. So I went back to the drawing board and decided a moist batter would be better for baked okra. Because coating slices of okra in batter would be a huge mess, I kept the pods whole, which is not how Southern fried okra is normally made. This time, the okra came out crunchy, golden, and delicious. The only odd thing was that the batter tended to pool underneath the okra pods, so that the bottoms were a little flattened, but that didn’t affect the flavor at all. I found that getting the baking sheet hot and letting the excess batter drip off before putting the pods on the pan helps reduce the flatness effect. My husband likes to dip roasted okra in ketchup, and he managed to convince me to create a dipping sauce for the oven-fried version. I made up a simple cocktail sauce with ketchup, horseradish, and hot sauce, but I can imagine a creamy sauce like Comeback Sauce or Roasted Red Pepper Dressing being even better. Perhaps the best thing about this cornmeal batter is that it can be used on just about any vegetable you choose to bake, though you will have to experiment with the time and oven temperature. Wash the okra and trim off the stems. Cut a piece of parchment paper to fit a baking sheet. Remove the parchment and place the baking sheet in the oven. Preheat oven to 450F. Place in the oven. After 15 minutes, remove and gently turn each okra pod. Replace and cook until outsides are brown but not burning, about 15 more minutes. Serve warm with your choice of dipping sauce. As I noted in the recipe, one of the best things about this cornmeal batter is that it can be used on just about any vegetable you choose. I found another great use for it, which I will be sharing with you in my next post. Stay tuned! I’d love to make this gluten free okra, but my daughter has a corn sensitivity. Any suggestions for another coating? You could try chickpea flour. It won’t have exactly the same flavor and texture but it might be good. I can’t wait to try this Okra recipe! I wanted to share with you that I modified your oil free pumpkin bread recipe to use for zucchini on Sunday! It was great! But I am sure you could do better! I replace the pumpkin with grated zucchini and used GF AP flour (I had to add a bit more, maybe 1/4 cup as it seemed a bit dry). And I added mini vegan chocolate chips instead of the nuts! I would love if you would publish a tried and true zucchini bread recipe, as those of us in the mid-west are going to be swamped with all things zucchini soon! so nervous I said dry instead of wet! Sorry for the errors! 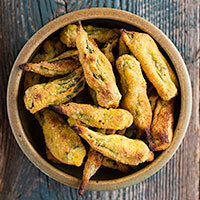 I’ve never tried okra before, I may have to try and find some as these look delicious! Susan, I don’t see any lemon juice in the ingredients. Do you just use a squirt as part of the overall measurement of the soy milk? Oops, sorry, I used 1 tablespoon of lemon juice. I’ll fix it now. Thanks for pointing that out! Just did this — thanks! Also — used the last half of the batter on sliced green tomatoes. Delicious! This sounds great. Your roasted okra recipe gets used alot in my house. I love okra but have only made it in a tomato base with Indian spices. Oven-Fried Okra? Oh, yeah….. can’t wait to try! Thank you, Susan! I can’t wait to try this! Being an Indian, I have always cooked okra differently but this sounds great. I know for sure I will add dry mango powder (available in Indian grocery stores) to these ingredients. It tastes great in okra. Sounds delicious. I like veggies in batter, but I never tried with okra. My favorite fried okra recipe involves no batter at all, rather putting the okra slices into a large bowl of cornmeal to cover. Let sit a bit so that the okra “slime” soaks up the cornmeal. Then, of course, fry in oil. Like eating popcorn!! I haven’t had any since I cut back on oil. I have wondered if baking would work instead of the frying, but I haven’t tried it. Want to try it for us?? I have always baked my okra. I cut it into bite size pieces and cover with seasonings and bake at 400 for about 10-12 minutes. I grew up eating fried okra in Oklahoma and California. I guess our version was simpler than those you are familiar with. We simply sliced the okra, rolled it in cornmeal and fried it in hot fat. It is one of the few things I still occasionally fry. Okra isn’t so common in the Pacific Northwest, since it needs warm nights to grow properly and prevent the pods from becoming tough. It is now more available, almost always at Asian markets. 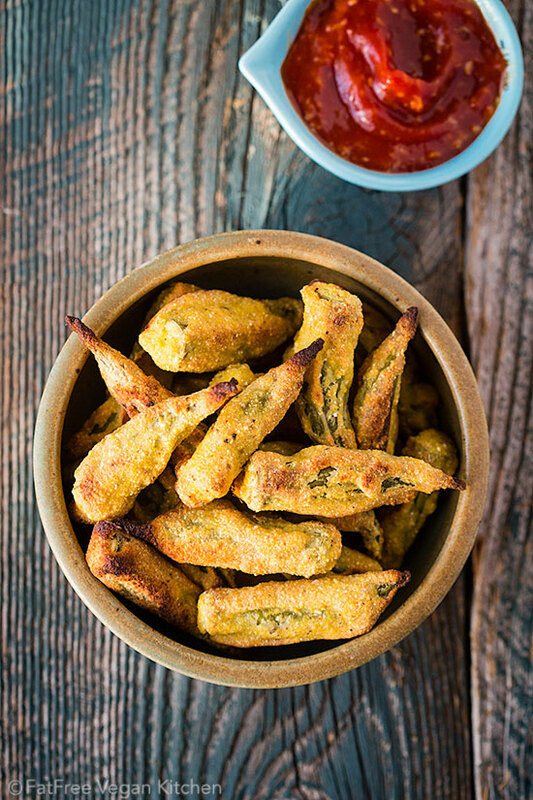 Because we seldom found okra back in the 1970s, we were thrilled to learn that you could get the same taste by slicing asparagus, rolling it in cornmeal and frying it! I know most people would think it a terrible thing to do with asparagus but we were thrilled with the discovery. I guess that proves that most of the flavor comes from the cornmeal. This looks amazing. Now I have a reason to try okra! This northern raised girl has never had it! What a delicious looking recipe. Thank you. You said in your post that it came out dry with out oil. And according to the calories there is oil, but its not listed in the recipe or the instructions. Thank you as I am new to the Vegan way of life and need all the help I can get. Hi Gaye, welcome to the vegan life! There’s no oil in the recipe, but there’s some fat in the nutritional info because all food contains a little natural fat. These look great, and I like the use of cornmeal. A great oil-free way to enjoy okra. And with roasted red pepper dipping sauce, yumm! Susan, where do you live that you have access to okra? My parents were from Alabama and I grew up eating fried okra and okra in soup. As an adult, I found I also love it pickled(which my mother thought was blasphemy!). I have never had it roasted, though it sounds like something I would love to try. I now live in Wa. State and have yet to see any okra here😢😢😢. This sounds like a great recipe! Hi Susan! I was wondering if you could use frozen sliced okra for this? I grew up in the north, NO okra. Since moving south, I have tried the fried okra in the deli.Didn’t know if I was doing myself a service or not. Better to eat fried okra rather than none at all (?) sort of thing. I found out I do not like it boiled(as in peas,etc.). I also wanted to know how you are doing? When I make vegan French toast, I soak slices of bread in a wet batter and then put out on a cooling rack so the excess can drip off before I put it on the pan to bake in the oven. I could see using that system for this recipe too. I can’t do cornmeal. What do you suggest as a wood substitute that would be about the same texture? You could try chickpea flour. The last time we made okra, my husband thought a plastic spoon had melted in the soup. This recipe came out much better and everyone loved it. I’ve always avoided the fresh okra at our CSA farm. Now I’ll be hoarding it! Thanks. I used this batter for onion rings and it was fine. I haven’t tried frozen okra in this. It might work, but I’m not confident enough to advise doing it. If you decide to experiment, please let me know how it goes. As an oh-by-the-way…. This works pretty well on mushroom caps, too. Susan you are simply brilliant!! !